The Trinidad moruga scorpion, one of the hottest peppers in the world. Researchers determined the golf ball-sized pepper has a mean Scoville Heat Unit value of 1.2 million. As I traveled the country this summer in search of America’s Best Burrito, I heard time and time again that the chiles in the United States weren’t spicy enough. It was an odd complaint, given the headlines last year about world-record-setting peppers from South Carolina. A Mexican family in Kentucky complained they couldn’t make the food they had in Zacatecas. In El Paso, a restaurateur told tales of crossing the border to Juarez just to get a burrito that packed some heat. I wondered, why were certain peppers spicier in some places than others? I’d been victim to dud chiles in the past. In New York, I’d purchased fresh grocery store jalapeños that turned out bland, spiceless chili, but found the same varietal in New Mexico set my mouth on fire. Why did the heat vary so much, and how could I be sure my future purchases packed the appropriate punch? Beyond that, what did it mean that the hottest pepper on earth had a Scoville rating of more than 2 million? How do you quantify the spiciness of a chili pepper? To put these questions about measurement in context, it’s helpful to know a little history. Born somewhere in the Amazon, where the borders of Bolivia, Peru and Brazil meet,1 peppers were one of the first cultivated plants in the Western Hemisphere. Chile pepper remnants found at a pre-agricultural site in Peru are evidence that the pepper was the first spice used anywhere on Earth (side note: though often categorized as a vegetable, chiles are really a fruit, as evidenced by their seeds). When Columbus set sail in 1492, he was likely exploring a route to India that would bypass the Portuguese-controlled waters extending down and around the Horn of Africa, leading the Spanish on a more direct path to the riches of the spice trade. When he landed in the Caribbean, he found that very “spice” native to the Americas that has since captivated global cuisine. Many of the modern-day chile varietals, including the serrano, guajillo and pasilla, were already an integral part of complex meals based on the distinct properties of each pepper. So what do those designations mean? Until 1912, there was no widely used method for measuring the heat of a pepper. That year, a pharmacist working for Parke, Davis & Co. in Detroit published a “Note on Capsicums” in the Journal of the American Pharmaceutical Association. The author, Wilbur L. Scoville, outlined a method for rating pungency, which has since come to be known as the Scoville Organoleptic Test. Here’s how it works: Capsaicin is the compound in chile peppers that makes them irritatingly delicious. A measured amount of capsaicin oil is extracted from a pepper using an alcohol solution. Five experienced human testers are gathered and sugar water is added to shot glasses of the capsaicin until three out of five panelists can no longer perceive any heat. The Scoville heat unit (SHU) rating is then assigned based on the quantity of dilution, with the ratings working on a linear scale: a 350,000 SHU habanero is 100 times hotter than a 3,500 SHU jalapeño. In his 1912 publication, Scoville explained that a physiological test was best because it was more sensitive than the technology available at the time. The comparison between various peppers was what mattered (capsaicinoids were and are an important ingredient in many pain ointments), so the physiological reading was the most important measure, he said. Still, the results of the method are about as accurate as could be expected from a five-person panel, producing wide-ranging heat designations for various peppers. There are several reasons for this variability. For starters, the number of mouth heat receptors varies greatly among people. More heat receptors means greater sensitivity, which may explain the insanity of YouTube videos showing people eating moruga scorpions and chocolate bhutla (some of the hottest peppers on the planet) — these people likely have fewer heat receptors. More sensitivity, however, also makes for a better taster. Paul Bosland, known as the “chileman,” is the founder of the Chile Pepper Institute at New Mexico State University and a professor of horticulture. He says people who are highly sensitive can taste the difference between peppers, differentiating the flavor of a jalapeño from a habanero with ease. Bosland told me he’s met three people in his career without any heat receptors at all, for whom ghost chiles, which have a SHU greater than 1 million, taste like bell peppers, which have a SHU of 0. Then there’s the issue of “taster’s fatigue,” the loss of sensitivity that occurs after someone tests a few samples. This is not only a logistical challenge for testing, but also makes it difficult to compare multiple samples of the same pepper. Multiple samples are necessary because the heat of a chile pepper varies dramatically by the conditions in which it is grown. More stress (like drought and high heat) allows for hotter chile peppers. One of the hottest known chile peppers, the Trinidad moruga scorpion, has an average SHU of 1.2 million, but individual plants can top 2.2 million. CaJohn’s Fiery Foods is an Ohio company that sells seriously spicy products. Many of the creations use the bhut jolokia, which was the hottest known pepper in the world in 2007 (it has since been surpassed2). Owner John Hand explained to me that in Ohio, the peppers with potential for extreme heat like the bhut jolokia can’t be grown with anywhere near the firepower they have in New Mexico, where the plants that went on to world-record fame were grown. Early on, there was debate over HPLC’s merits. “A computer can analyze, but only a human can taste,” one researcher told The New York Times in 1989. But the hottest pepper on record back then was the habanero, with 150,000-350,000 SHU. Today’s hybrids make that seem bland, with ratings leaping well over 2 million. The HPLC method is now widely preferred, at least among researchers and the spice industry, for its reliability and accuracy. But it’s not without problems. First, there are compatibility issues. Bosland says researchers use dried samples, while growers often measure fresh pepper, which can be as much as 98 percent water. Similarly, hot sauce companies will often report the heat of peppers used in their products based on dry lab samples, not accounting for the dilution of the actual sauce the purchaser will consume. And remember those 22 known types of capsaicinoids? Each has a unique flavor profile. The HPLC provides the quantity of each type, but doesn’t illustrate how they work in combination to produce a heat profile. Bosland offered one example: Several years ago, New Mexico farmers exporting their peppers to Asia were told the quality of even their best peppers was poor. They finally realized that all but one of the New Mexican varietals has what Bosland describes as flat heat, as if someone has painted the heat around your mouth, as opposed to the sharp “pins and needles” heat that is common in Asian cuisine. The researchers then sent the Sandia pepper, the lone sharp variety grown in New Mexico, and it was warmly welcomed. How fast does the heat come on? Asian types of chile peppers produce instantaneous heat, while habaneros are known for a long delay. How long does the heat linger? Asian varietals tend to punch you in the mouth and diminish, while habaneros linger, the heat creeping up over several minutes. The lingering makes them taste “hotter,” even if they aren’t higher in parts-per-million of capsaicinoids. Is the heat sharp or flat? Peppers can produce a sharp pins-and-needles feeling or produce the sensation that someone has spread heat inside your mouth with a paintbrush. Where in the mouth do you sense the heat? Habaneros burn the back of the throat, while New Mexican varietals scorch the mid-palate. What is the amount of the actual heat? This is what is measured by the HPLC test. While Bosland prefers HPLC and uses it regularly (his lab helps other labs equipped with HPLC testing calibrate their machines), he agrees that some of the nuance of human testing is lost. Most of us eat peppers chopped, diluted, or otherwise subdued until the heat is not only palatable, but enhances its edible companions. 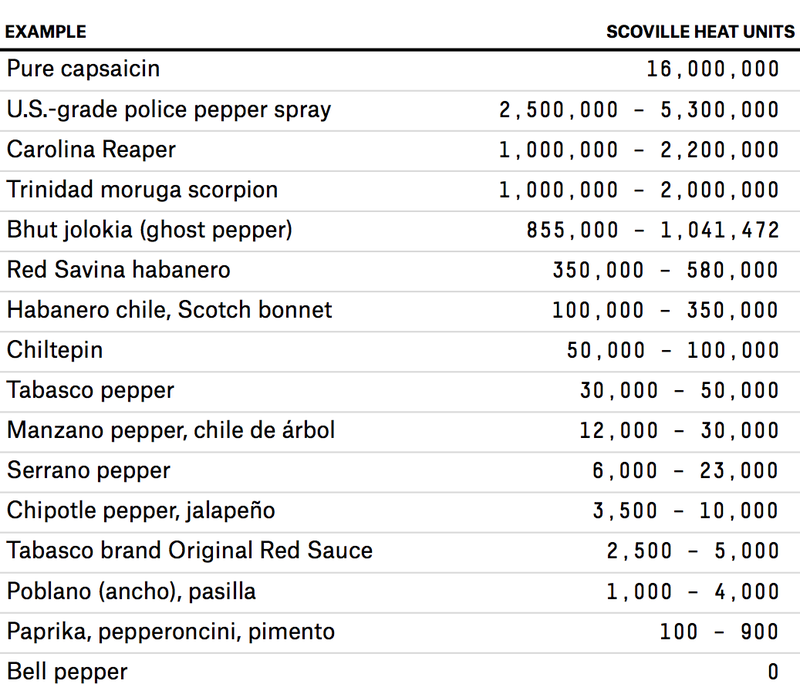 The Scoville rating of the pepper alone is fairly meaningless without the liquid and other ingredients that are mixed in a chile-spiced product. And of course, CaJohn’s idea of “mild” and “hot” is vastly different from the Pace Picante Sauce you’ll find in just about any grocery store. So in the end, I’m not far from where I started: If I really want to know how hot that pepper is, I’m just going to have to taste it. There are various theories about the origin of the chile pepper. Some say it originated in the Amazon, while others point to genetic evidence that it was independently domesticated in South America, Central America and Mexico. By the time of Columbus’s arrival in the “New World,” however, peppers were well established throughout the region (not including Canada and the upper United States). The most recent world-record setter, the Carolina Reaper, was the creation of a cultivator in South Carolina. The hottest peppers are usually found in impoverished areas, where it’s important that a little go a long way — one is even called seven pot, in reference to the seven pots of food a single pepper can spice. An ASTA measurement can be roughly converted to Scoville heat units by multiplying it by 15. Scoville heat units are still commonly used, particularly with consumer products.